On Wednesday College of the Ozarks President Jerry C. Davis , and several Missouri business leaders, met with President Donald Trump during his visit to Boeing in St. Louis. During the meeting the business leaders took turns telling the president how they have benefited from the historic Trump tax cuts. 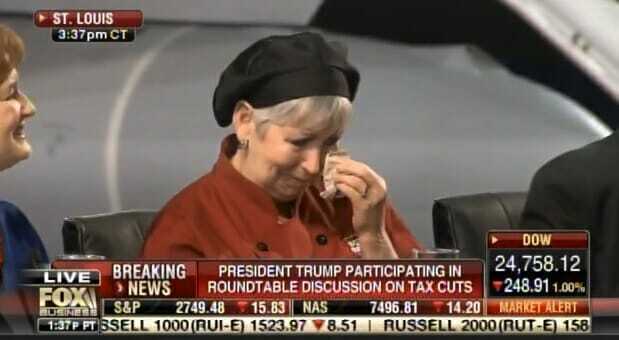 Bonnie Brazzeal, a cafeteria employee at College of the Ozarkz, broke down in tears as she thanked President Trump for her tax cut bonus.Ozarks. Bonnie Brazzeal: Mr. President my name is Bonnie Brazzeal. And I work at the cafeteria at the College of the Ozarks alongside the hardworking students. And I am very grateful for the bonus when the college gave it to us. And I put mine in savings for my retirement. And I want to thank you, Mr. President and God bless you. Someone needs to forward this to “Crumbs” Pelosi.